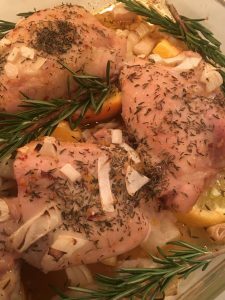 Citrus Herb Roasted Chicken | Ridge's Stitches | Health Coach. Yoga. Clothing. I was living at my parents for about a month while my house had asbestos contamination. This put quite the damper on my cooking since I was commuting to and from the city to the burbs. My yoga classes would start around 6am and end around 8pm most days. I cherished every moment that gave me the opportunity to cook up a good meal. Plus, I love to share food with others so making this dinner for my parents and sister was super rewarding! The citrus from the orange and lemons in this dish mixed with the fresh rosemary and dried thyme was the perfect combo. Whisk olive oil, garlic, lemon juice, orange juice, paprika, salt and pepper in a small bowl. Put chicken in a 13-inch x 9-inch baking dish. Pour the olive oil mixture over the chicken, coating all sides. You can also marinate the chicken in this mixture for enhanced flavor. Arrange lemon and orange slices and onions around and under the chicken. Top with rosemary, thyme, salt and pepper. Roast uncovered for about 1 hour, until chicken is cooked and juices run clear. Remove from pan and top with fresh rosemary.